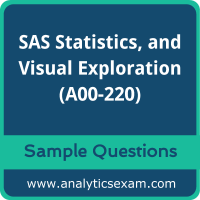 Here are the sample questions which will help you be familiar with SAS Big Data Preparation, Statistics, and Visual Exploration (A00-220) exam style and structure. We encourage you to try our Demo SAS Big Data Professional Certification Practice Exam to measure your understanding of exam structure in an environment which simulates the SAS Certified Big Data Professional Using SAS 9 Certification test environment. To make your preparation more easy for SAS Certified Big Data Professional Using SAS 9 (A00-220) exam, we strongly recommend you to use our Premium SAS Big Data Professional Certification Practice Exam. According to our survey with certified candidates, you can easily score 85% in your actual SAS Certification exam if you can score 100% in our premium SAS Big Data Professional Certification practice exams. Q1: Which option in the properties of a Clustering node allows you to identify which clustering condition was satisfied? Which one of these can the Data Quality Steward apply in an Execute Business Rule node in a data job? Which conclusion is supported by the output? A. The portfolios differ significantly with respect to risk. B. Assets in portfolio B are significantly more risky than assets in portfolio A.
C. Assets in portfolio A are significantly more risky than assets in portfolio B.
D. The portfolios do not differ significantly with respect to risk. Which SAS program fits this model? Q5: A sample of data has been clustered and found to contain many multi-row clusters. To construct a "best" record for each multi-row cluster, you need to select information from other records within a cluster. Which type of rule allows you to perform this task? Q6: How are the Field name analysis and Sample data analysis methods similar? A. They both utilize an identification analysis definition from the Quality Knowledge Base. B. They both require the same match definition from the Quality Knowledge Base. C. They both require the same identification analysis definition from the Quality Knowledge Base. D. They both utilize a match definition from the Quality Knowledge Base. Q7: How do you access the Data Management Studio Options window? Q8: In SAS Visual Analytics Explorer, when a date data item is dragged onto an Automatic Chart visualization either a bar chart or a line chart will be created. What determines the type of chart created? A. The properties associated with the automatic chart determines the type of chart displayed. B. A line chart is created if the Model property of the data item is set to Discrete, a bar chart is created if the Model property is set to Continuous. C. A bar chart is created if the Model property of the data item is set to Discrete, and a line chart is created if the Model property is set to Continuous. D. The format applied to the date data item determines the type of chart displayed. Q9: Using SAS Visual Analytics Explorer, a content developer would like to examine the relationship between two measures with high cardinality. Which visualization should the developer use? Q10: When selecting variables or effects using SELECTION=BACKWARD in the LOGISTIC procedure, the business analyst's model selection terminated at Step 3. What happened between Step 1 and Step 2? A. - 2 Log L increased. D. Pr > Chisq increased. Note: Please write us on feedback@analyticsexam.com if you find any data entry error in these SAS Certified Big Data Professional Using SAS 9 (A00-220) sample questions.